Mark is still very much in mourning after the loss of his wife Rebecca. He buries himself in work, has few friends, doesn't date and doesn't really socialize. What he doesn't know is that this is all about to change. Mark receives a letter in his own hand writing with a list of instructions about what to do when he finds himself sent 17 years into his own past. Like anyone else, Mark is tempted to go back to make changes. Who after all doesn't have some regrets? Unfortunately, time cannot be changed without consequences and this is where The Doctor (#11), Rory and Amy come in. 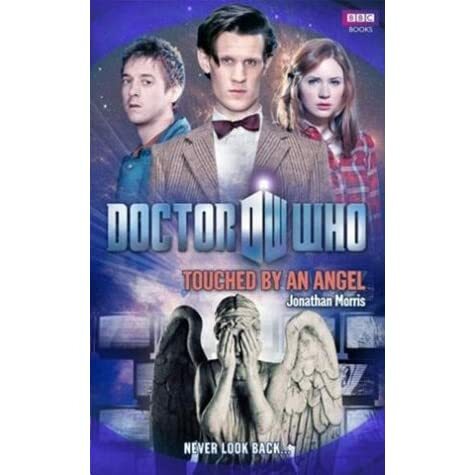 Touched by an Angel very much reminds me of Blink (season 3 episode 10) during David Tennant's tenure as the Doctor. Luckily, Mark's story is compelling enough to stand on its own and the Doctor's small role didn't decrease my enjoyment of the story. Touched by an Angel is about more than killer statues and wibbily wobbly timey wimey bits, it's about love and loss. I think anyone who has ever lost someone they cared deeply about will closely connect with this story. It was interesting to watch the relationship develop between Mark and Rebecca, even as the story inevitably led to Rebecca's death and the terrible choice Mark had to make. I couldn't help but myself in Mark's shoes and think about what I would do if I had the chance to save someone I love. Morris takes care to include a ton of 90's references to give us a sense that Mark has indeed traveled back to the 90's. We follow the journey and watch Mark mature from a young man full of hope, to a middle age man dealing with loss and desperation. Similarly, Mark's relationship with Rebecca evolves from one of friendship to an established romantic relationship with all of the pitfalls that this includes. Like any other couple, they make plans but life gets in the way. It's a strong reminder to make the people we care about a priority because we never know when our last day will be. The angels have long been one of my favourite aliens in the Whoverse. Morris has a tough act to follow given that in New Who, the weeping angels were brilliantly written by Moffat. The angels in this case are looking to feed off of a paradox, something we saw in The Angels Take Manhattan (series seven, episode five) Every time the Doctor, Amy, Rory and Mark found themselves challenged or surrounded by the angels, I found myself struggling not to blink, completely caught up in the story. The angels translated very well in Touched By and Angel and are just as horrific as I have seen them on television. Unfortunately, Amy Pond was not very well written. To be upfront, I have never been a fan of Amy and Rory because they remind me so much of wet lettuce. Amy didn't seem to really do much and I didn't really get a sense of a bond between her and the Doctor. Predictably, Rory ended up running around and doing the Doctor's bidding, with a touch of sarcasm thrown in for the sake of comedy. I'm not convinced that Rory and Amy worked in Touched by an Angel; however, I wasn't convinced about them on the show either. I think it's fair to say that Morris did have some difficulty with the Doctor. In each incarnation the Doctor is still the same person but with personality flaws. In the case of Matt Smith's doctor, I found that his frantic energy didn't really translate well to this story. I did however love that Morris had Rory wearing a fez (cause fez's are cool don't ya know). I love the Doctor's earnestness about his outfit and how it made him cool and gave him the ability to pass as a university student, even as Rory and Amy rolled their eyes and giggled behind his back. I do however firmly believe that Morris could have done a little more to cement the Doctor's personality. That being said, with a few tweaks, Touched By An Angel could easily have made it as an episode and left me feeling happy because of its emotional content even if it's Doctor Light. One of my ongoing issues with Doctor Who is that it isn't nearly as inclusive as the reputation that it has. In this case, we did have two LGBT characters and a character of colour. It's worth noting however that since Mark is the protagonist, these characters were not really developed and I really wouldn't even label them side characters. Still, it's a nod, though it's time for the whoverse to get serious about its inclusion. Coming in at 156 pages, Touched By An Angel is more of a short story than it is a book. I read it quickly in a few hours and really enjoyed it. It's absolutely written for fans of New Who fans. Fans of Matt Smith, Amy and Rory might find themselves a little bit disappointed with the characterisation but the story itself is really good and hey, Weeping Angels, need I say more?